Uglyworld #312 - Heads Are Going To Roll!!! (29/365), originally uploaded by www.bazpics.com. 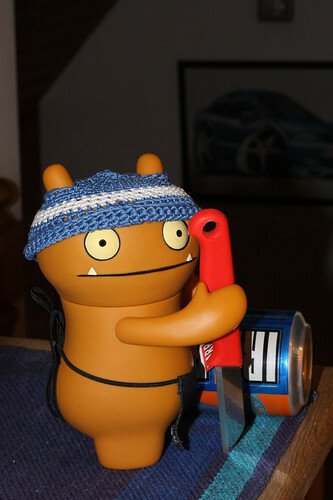 To say that Wage was angry when he discovered that his final can of Irn-Bru had been drunk would probably be the biggest understatement of the year so far, he was simply furious. I tried to explain to him that the next chance I get to be back in the UK I'd bring him back a few new crates only for him, but did it help, oh no it didn't. He stormed into the kitchen and returned brandishing a knife which he hammered off the table to, and then shouted at the top of his lungs "Right you $#%}ers, I'm going to count to ten and I want the person responsible standing right here before me, 1....". Needless to say the other uglies all ran off to their favourite hiding places and stayed silent all through Wage's standing ten count (which got louder as he got closer to 10, "8.....9.....TEN!!!". There was a brief silence after which came a roar and then the mashed up and mutilated can was thrown across the room. His final words before he stormed off to his bedroom were "Heads are going to roll!!! ".